It's the end of the current month and it's time to say Goodbye to March 2016. The weather was excellent this month with only a strong shower during the first day of this month and after that it was mostly sunny and slowly but steadily it started to heat up, little by little, day by day. We had some nice cooling wind the last couple of days of this month and it was partially cloudy at times, but it remained dry all month long except for the 1st March. Water is needed though, to replenish the ground water levels, but at the moment, there's no rain in sight. This month was a busy month for me where I was on the road most of the time. First I was on Koh Phangan for a PADI IDC and now I'm on Koh Lanta where I started a PADI IDC yesterday. We visited the 'U Koh Madsum' resort on Koh Madsum which we really enjoyed and I also presented a Box jelly fish awareness and prevention presentation there, for the local hotel staff. Last weekend I participated for the third time in the Koh Samui Midnight Run, which was held for the fourth time and I came second in my age group in a new personal best time in this race. We had dinner at the 'U Koh Madsum' and our favorite Japanese restaurant on the island at Kobori in Maenam. A busy and enjoyable month and it's time to start looking forward to April 2016. See you all next month! On Koh Lanta it seems that another blue sky is shaping up and although we have cool mornings here, current temp at 7am is 22C, during the day it really heats up here with temperatures well into the high thirties. The PADI IDC on Koh Lanta for March/April 2016 has started here yesterday and we have a full house with 6 candidates from all over the world. The forecast is looking good for the next ten days with a light breeze and sunny skies with sometimes a few clouds in it. The good weather patch of March 2016 seems to continue well into April. 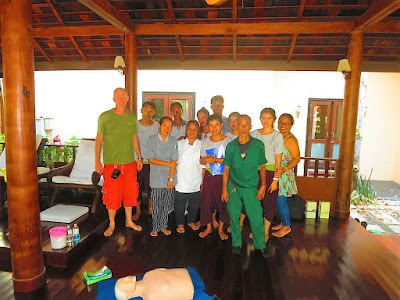 We had an invitation from the 'U Koh Madsum' resort to present a box jelly fish awareness and prevention presentation and this resulted in our stay at 'U Koh Madsum' resort in March 2016. Here's a post of our stay and how we enjoyed it. The 'U Koh Kadsum' is located at a small island just South off Koh Samui and you need to get there by car and for the last bit, by boat. The pier is located at Phang Ka, in the deep South of Koh Samui. The cross from the mainland to Koh Madsum can be made with a free transfer with a wooden boat with is scheduled to shuttle three times per day between Phang Ka and Koh Madsum or if you prefer, you can book a private speedboat charter pretty much at any time of the day. 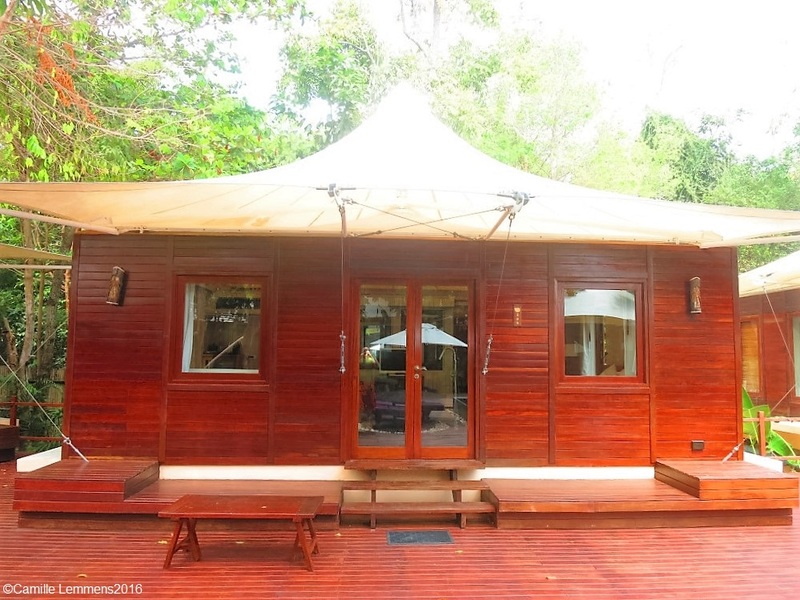 If the island starts to become too small after having stayed for a couple of days, these are also great options to enjoy a day on mainland Koh Samui. The resort offers various kind of accommodation with a total of 37 villas. 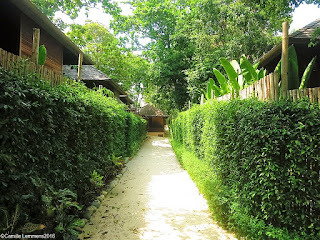 We stayed at the 'Tented Villas', of which there are 8, surrounding a swimming pool. 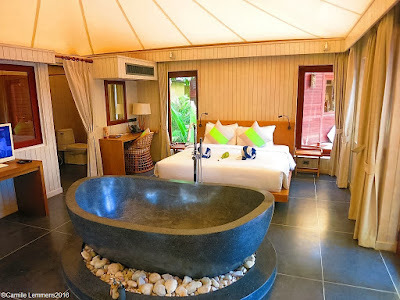 With 46 square meters, they are comfortable and they have a massive stone bath tun in the middle of the room, which was well and enthusiastically used by all family members, that were split out over two villas. 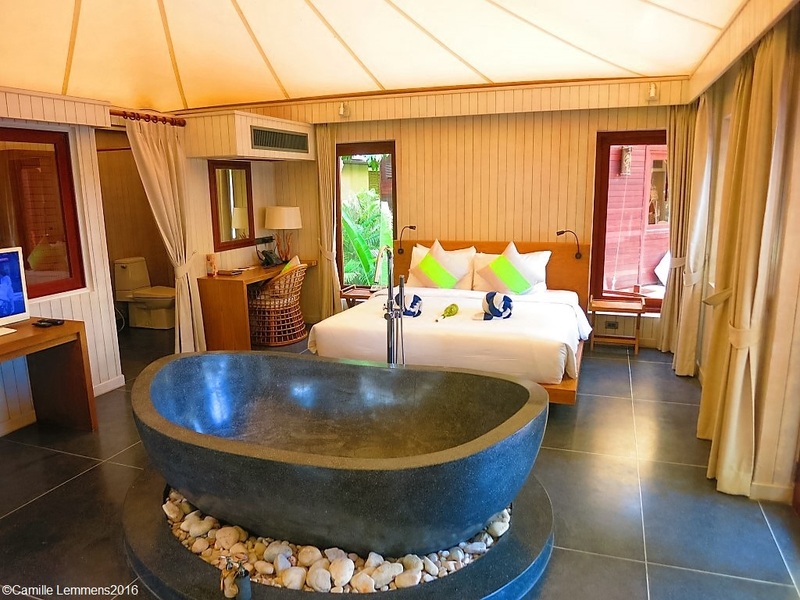 There are 16 Sala Villas with 61sqm, 8 pool villas with 96 sqm, 4 beachfront pool villas with 93sqm and one 2 bed room beach front pool villa with 163 sqm to enjoy your time there. It's all very spacious and relaxed and there's 'The Coral restaurant' as well, for breakfast, lunch and dinner. The restaurant supports a pool as well, with a lovely view over the rocky beach, with the opposite site of the island, where you arrive, supporting the sandy end very quiet beaches. The whole atmosphere in the resort is laid back and relaxed. You can go for a long beach walk or hang around next to the pool and just enjoy the easy going island life style. The villas are all very comfortable and the air conditioning may be a welcome change if it gets too hot outside. We enjoyed our evening with a relaxed dinner at the restaurant, under a full moon with a good choice between Western and Thai food. The next morning we had a good breakfast with once more plenty of Western and Asian options and a great view over a sunny Gulf of Thailand. When we took the boat back to the mainland, we enjoyed a visit to a temple nearby, which I had never noticed or visited before, the Chinese Guanyin Temple in Phang Ka, a write up is coming soon and on the way back, we had a lovely lunch at Sweet Sisters, a mere 7 km away from the pier. In Thong Krut there are also a few nice places to eat in case you decide to head over to Samui for a few hours. We enjoyed our stay at 'U Koh Madsum' resort in March 2016 and we can recommend a stay here. It's relaxing, no cars, no motorbikes with beautiful views and great villas. Yesterday afternoon I arrived safe and well on Koh Lanta for another PADI IDC, about to start in an hour or so and it's already the second PADI IDC here this year. Yesterday saw a partially cloudy sky and a strong wind blowing, cooling things down a bit if you were along the Koh Samui coastline, with a max temp of 32C. The forecast for Koh Samui has changed once more, two more days of breeze blowing over the island, including today but the predicted cloud cover has moved away and the chances of rain are also very slim again. Enjoy the last two days of this stunning March 2016 version. 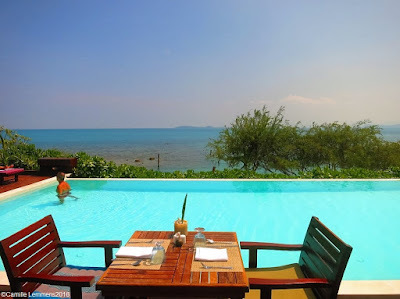 A partly cloudy sky is shaping up over Koh Samui with about sixty to seventy percent of the sky still being blue. There's also a very stiff breeze and small craft and boats may not be going out today. Current temp at 7am is 29C but with the wind it's nice cool. This morning I'm off to Koh Lanta for a PADI IDC starting tomorrow and should be back just after Songkran. The forecast changed slightly, the strong wind now seems to last until the weekend but the chances of rain have drastically gone down. There may be a few cloudy days after the weekend and before that it may be partially cloudy with plenty of sunshine and a cool wind. The excellent weather conditions of this month are continuing! The forecast predicts strong wind for today, fizzling out by Wednesday but with possibly rain for today or tomorrow projected. The clouds should back off Wednesday and the start of the weekend but may be back next weekend. Don't think it will get any cooler though! The 4th Koh Samui Midnight Run was a big success last night, there were 950 participants compared to 80 last year. Well done to the organizers, the Thai Hotel Association or THA and the The Thai Association of Koh Samui or TAKS for bringing this event so well up in the events around the island. Each year has seen an increase in participants and next year the one thousand participant barrier should be broken. Very well indeed for a charity event and it will raise a big check for the school for autistic children. It's not easy to organize such an event in Chaweng, especially at night with so many interests at stake, but the organizers did a good job, with well signed off running lanes and staff along the route to make sure everything went smoothly. This can be a challenge with all the traffic, by car, motorbike and on foot at Chaweng beach road. Highlights were as each year the start and finish line, the latter this yer without too much traffic during the finish and the run through Chaweng beach road and specifically running through Soi Green Mango and maneuvering your way through the night life crowd whilst being cheered on by all bar staff. It's also good to see that many bars offer free water to the runners, much appreciated! A fun event with lots of participants, something that Koh Samui can be proud of. Hope to be there next year and race for first place in my age category! The next running event will be the Samui Bikini Neon Run this coming Sunday 10th April with a 6am start. Hope to see you there, but not too sure if I can make, since I may be away from the island. A bit late this morning with an update because I didn't get to bed until 3am last night because of my participation in the 4th Koh Samui Midnight Run. More on that in a moment. 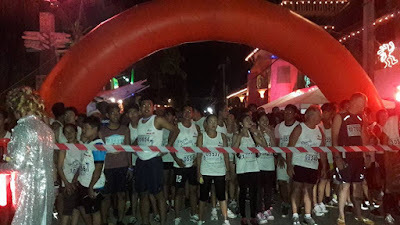 The 4th Koh Samui Midnight Run was a great event with over 950 participants, an increase compared to last year when 800 people participated. The race went well for me and for the third time out of four races I placed second in my age category. Last year I couldn't participate because I wasn't on the island. On Koh Phangan the PADI IE for March 2016 was successfully completed for all of my candidates who participated in the March 2016 PADI IDC on Koh Phangan in conjunction with PADI 5* IDC Center 'Haad Yao Divers'. The forecast predicts a strong breeze until Wednesday going hand in hand with some long an hard needed rain. From Thursday onward it may remain partially cloudy but it should be dry again. Don't forget the 4th Koh Samui Midnight Run tonight at the Reggae Pub in Chaweng. The forecast has changed a bit again, there is a fairly strong wind blowing which may last until Wednesday and it may a little bit rough out on the ocean and from Monday through Wednesday there may be some hard needed rain. This month has only seen some rain around Samui island on the first day of the month! Early next month it should be nice and warm and sunny again! The forecast has changed a bit again, later today we may seem the wind picking up with Monday and Tuesday actually having some strong wind and Monday may see some rain. Sunday and Tuesday may also see some rain, but a lot less compared to Monday. The forecast changed slightly, the heavy cloud layers predicted for this week have mostly disappeared, it will be a little bit more cloudy as of tomorrow for the next four day and the wind will pick, with brings in a cool breeze, but in general, the sunny days continue, the heat keeps climbing and this March looks a great one, with just one day of a little bit of rain so far! 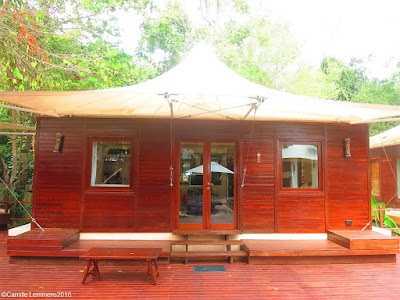 We are guests at the 'U Koh Madsum' Resort, just South of Koh Samui and yesterday I gave a Box jelly fish awareness presentation at U Koh Madsum resort at the lovely and secluded island of Koh Madsum, sometimes also written as Koh Matsum, but it's all the same island. Twelve staff members of the U Koh Madsum resort staff came to the presentation and all kind of staff was presented, from kitchen staff to maintenance and service staff. This South Western part of Koh Samui, where Koh Madsum is located, has no known box jelly fish incidents on record, as far as I know of, but it's still a very pro active approach of the resort management and it shows that they really care and take the box jelly fish problem around Koh Samui and in the Gulf of Thailand serious. After the presentation there was also an opportunity for all attendees to participate in CPR training, although most of the staff were too shy to give it a go. It was a successful presentation though, with more hotel staff around Koh Samui that is now more aware of how to handle and deal with box jelly fish incidents. Thanks to 'U Koh Madsum' for the invite and it's a very nice place to plan a visit and stay a few nights. Yesterday saw another very sunny and warm day around Koh Samui with a max temp of 33C. The temperatures are rising! The forecast does predict more cloud formation until Sunday and the wind might pick up a bit come Friday. After the weekend the sun should be out again in full force. A few small clouds are up in the sky over Koh Samui this morning but it looks like the blue will take over soon, especially when the sun comes out and starts to heat up. Current temp at 7am is a nice and cool 26C, enjoy the morning coolness before the sun starts beating it out and it heats up. 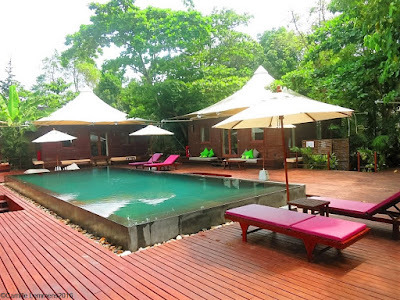 Later today we will go to Koh Madsum where we will stay at the U Koh Madsum hotel. I will be giving a box jelly fish presentation and a report of our stay will come up soon. The forecast predicts the clouds to pick up come tomorrow until next week Tuesday with occasionally some strong wind but hardly any rain. March has been great this year and it is heating up nicely. The first ever Samui Bikini Neon Run, Sunday 10th April 2016 is being held by Central Festival. Not many details are available yet, but there is a 6am start on Sunday morning. I would imagine start is at Phru Chaweng, since it's more or less opposite Central Festival but it's not guaranteed, more details will surely follow. Another advertisement states that it's the first time such an event is held in Southern Thailand and that supermodels will run with you. There's a bikini beach run each year in Hua Hin, where you are asked to dress in a bikini for the girls and for the guys in your favorite Speedo. This was last weekend. Maybe it's something like this. Whatever and where it will be, more details will follow soon, so stay tuned! The forecast predicts heavier clouds from Wednesday to Sunday, the wind to pick up come Friday but by Monday it all should be nice and sunny again. Possibly some rain on Sunday. Keep the sun lotion within hand reach! Yesterday saw once more a nice and sunny day around Koh Samui with a max temp of 32C. Our house felt really hot. The forecast predicts a cloudy but dry Wednesday and as of next weekend a strong breeze with possibly a hard needed rain drop. The forecast predicts some heavier cloud formations as of Wednesday with possibly some hard needed rain towards the last couple of days of the month. Up until next Wednesday it should be dry and sunny. Since I came home late last night, we went out to one of our fave restaurants on the island and we had some great Japanese food at Kobori in Maenam. For the next ten days, the forecast shows sunny skies except for Wednesday and Thursday when heavy clouds are expected but it should stay dry nonetheless. Enjoy! Yesterday we completed the current March 2016 PADI IDC on Koh Phangan and today we will tackle the EFR Instructor course. After that it's back home on the last ferry of the day, off to Koh Samui again and I will be back in a weeks time for the PADI IE. The forecast is looking good for the next ten days, sunny skies with some more clouds building up late next week and some stronger wind over next weekend. Enjoy the sun and make sure to have the sun lotion at hand if you spend your time on a beach. The forecast didn't change much for the next ten days and the 2016 version of March continues to give us nice and sunny days. Enjoy and be careful out there in the sun, don't get sunburned. Yesterday evening I conducted 'Box jelly fish awareness and prevention presentation on Koh Phangan' at 'Sweet Cafe' in Thong Sala for around 40 to 50 dive professionals. This was a great turn out and it was a really captive audience. The Thai box jelly fish work group has been multiple times on Koh Phangan, but they only talked to Thai institutions and groups. This was the first time that information about box jelly fish was offered to Western groups and this was only to the dive community members. The presentation was as already mentioned about awareness and prevention and it seemed that listening to the feedback, the information provided hit home and hopefully the awareness has been raised and prevention measures will be implemented. Thanks to all the members of the Koh Phangan dive industry that showed up, it's great to see the numbers of attendants like this and thanks to Heike at Haad Yao Divers who organized the presentation and last but not least, thanks to 'Sweet Cafe' fr opening your doors after hours and having us as guests. If you know anymore people or organizations who are interested in this kind of presentation about box jellyfish on Koh Phangan, please get in touch with me. This evening, at 8pm, I will give a box jelly fish awareness and prevention presentation at 'the Sweet Cafe' in Thong Sala on Koh Phangan. Entrance is free. The forecast predicts a every second day a bit of a coll breeze and in general blue and sunny skies which will bring warm days. Every day it's becoming a little bit warmer. The forecast is changing for the better, the next ten days will see even more and intense blue-er skies. If you haven't reached your sun lotion yet, it;'s about time! The current PADI IDC on Koh Phangan has already reached the half way mark. The forecast remains steady and that means that we will have sunny days and the temperature will slowly but steadily increase, day by day. Make sure to have the sun lotion within hand reach. The 4th Samui Midnight Run 26th March 2016 is just two more weeks away and it looks like it will be a great event again. Come and join the fun, registration for the 10km, 5km and fun run races can be done at Zazen Boutique Resort in Bophud for 500.-THB per person or 1,500.-THB per person but this will include a grand prized raffle ticket with the chance of winning a scooter. It's well worth to sign up in advance since my understanding is that signing up on race day will set you back 1,500.-THB. It's all however for charity, so the money will be well spend! The race course takes you through Chaweng beach road, the soi Green Mango and along the lake with a start and finish at the Reggae Pub. Looking forward seeing you all there, you will find my at the front of th start line come midnight on the 26th! The forecast remained steady for the next ten days with nice and sunny skies all the way through until after next weekend. Slowly but steadily it starts to heat up and is getting warmer, almost day by day. Heatwaves and water shortages have been predicted. The forecast remained stable and the next ten days are looking very good. Tomorrow a strong breeze followed by really sunny days with blue skies by mid next week. Forecasts have predicted some serious warm water over the next weeks with max temps of 44C!